Come Christmas morning, 475 families will be opening presents thanks in part to Wabash College and its involvement in the Montgomery County Youth Services Bureau’s REINdeer project. 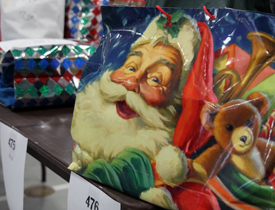 According to Alecia Franklin, Senior Administrative Assistant to the Dean for College Advancement and Development and co-coordinator of the REINdeer program at Wabash, this year Wabash faculty, staff, students, fraternities, and various clubs, supported 61 of the 475 families that are being helped this season. The College played host to the project’s gift distribution through Knowling Fieldhouse. Franklin said the shear sight of Knowling filled with gifts for the more than 1,700 people that make up the 475 families is truly heartwarming. In addition to the College facilitating the drop-off and pick-up location for gifts, Bon Appetit, the College’s food service provider, donated coffee and treats for the participants. Despite a difficult economy in recent years and a growing number of families in need of help, Franklin said the Wabash community has actually increased its involvement over the past few years. Franklin said that this is just a testament to how involved Wabash is in Crawfordsville and Montgomery County. David Troutman, Director of Gift Planning here and REINdeer’s co-coordinator with Franklin at Wabash, said the responses to campus-wide emails were immediate and positive, “wonderful” he said. “Since [Franklin and I] have been doing it, the campus has been great at embracing and responding to the REINdeer project,” Troutman said. As the Advancement Office, which Franklin and Troutman are both a part of, has through various endeavors, like the Senior Gift Campaign, made an effort to instill in students the importance of giving back to one’s school and one’s community. Troutman said giving back and involving oneself to make a positive contribution in community is something that a Wabash man gains through their education. Giving back is not something that is meant to last only four years, while a student is on the Wabash campus, but Franklin said projects like these can help form that “habit” of giving back that can be taken wherever students call home.